“Give me the impending changes in the cricket structure and I will give you the promised four year term”. This is the message that Sports Minister Mahindananda Aluthgamage has for Sri Lanka Cricket officials. “I have nothing against any individuals in the cricket administration, but, we find that the prevailing system in the country is wrong. We want that changed,” the minister said. 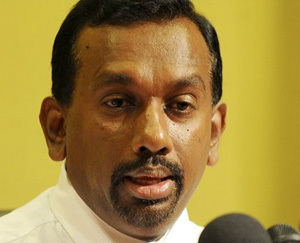 Mr. Aluthgamamge said he felt if the cricket officials did the changes within the prevailing structure they might not be able to harness the necessary votes to come back to power. “If they can bring forth changes that are healthy for the system they could have the four year term that I have promised,” he explained. The minister pointed out that under the prevailing system, officials were elected for a one-year term and then they strive for the first six months to formulate a plan of action but in the latter half of the year their priority was on the next election and how to please the cricket electorate. The minister also said he hoped to offer this four year term in office to all sports bodies in the country. The system will work in stages with the officials being offered two years first and two more years if only their performance is good. Meanwhile, the Sunday Times Sports learns that authorities are not finding it easy to curtail or re-structure the player payments. Even the recent player-SLC conflict over the signing of their contracts was due to the SLC trying to cut down on some payments that were scheduled for the players. The national cricketers whose contracts expired in March this year signed their yearly central contracts just before the just concluded SLC T-20 tournament. Besides that, in the past few years the SLC under various administrations has been trying to change the club-based system to a province-based one backed by the prevailing club system. But all attempts have failed so far, with the clubs which have the votes holding on to their stance stubbornly. The clubs fear that once a provincial system is served as the main course, the clubs will lose their grip on the system. Yet, there was a major morale and strategic victory for the SLC when it managed to bring some order into the prevailing school cricket system in the country. Teen cricket in Sri Lanka, which was one of the strongest or the strongest in the world a few years ago, has deteriorated to a stage where Sri Lanka became the first top cricket playing nation to get eliminated from this year’s Under 19 World Cup tournament, which just came to a finish in Australia. Now with the new system the unsupervised and uncontrolled spread of school cricket would be curtailed and the SLC will also have a role in nurturing the teen cricket system in the country. This system will come into effect with the coming 2012-13 first eleven cricket season. Now Dilshan wants to quit Test cricket. Ceylonese golf history – Priceless!